With the redevelopment of the 2500 block of West Broadway, we saw the closure of several businesses including Kinome Japanese Kitchen, Benny's Bagels and Aria Florist and Wedding Design. Benny's has reopened as a retail outlet and possibly a cafe in the future. Aria has also relocated. 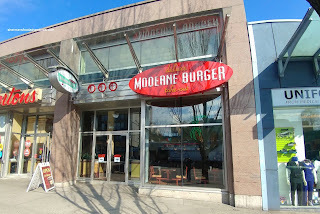 Probably one of the most anticipated relocations is Moderne Burger where it took several months of delay to finally open a month ago. Taking over the old Wendy's spot right next to Tim Horton's at 865 West Broadway, they have now become a counter service operation with slightly lower prices to go with the slightly smaller burgers. Since they are starting off with a fairly simple menu, I ended getting everything that they had including the Steak Burger with lettuce, tomato, red onion, mayo and house sauce on a fresh baked bun. 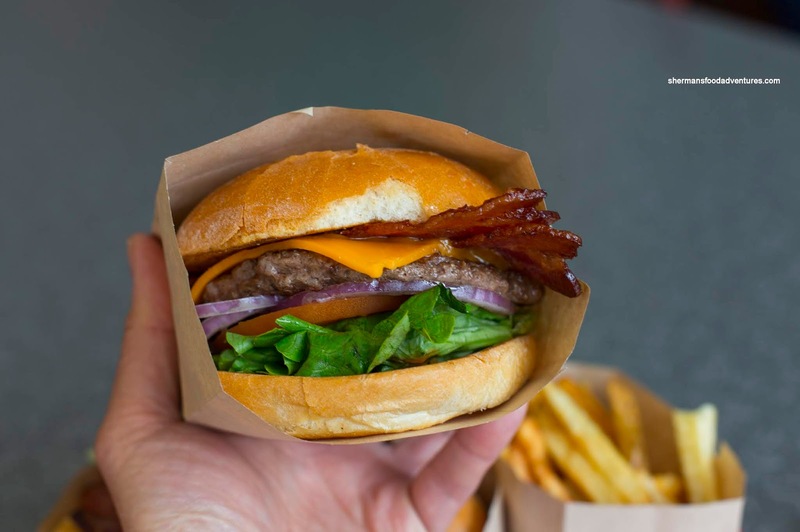 Since we all love cheddar and bacon, this was added to all of our burgers (good for the picture too...). If you can appreciate, Moderne Burger has always prided themselves on being rather basic by letting the ingredients speak for themselves. In this case, that is essentially what this burger was about. Nothing complex nor mind-blowing, but a solid burger consisting of lean unseasoned beef that was accompanied by real cheddar, crispy lean bacon and fresh ingredients. For myself, I doubled it up and of course the burger was larger and more robust. Solid all the way in my opinion. The only other option (unless your are a vegetarian) was the Turkey Burger with the same ingredients and yes, we added cheddar and bacon. This was actually surprisingly good. Although the turkey patty should've technically leaner than the beef, it was actually more moist. 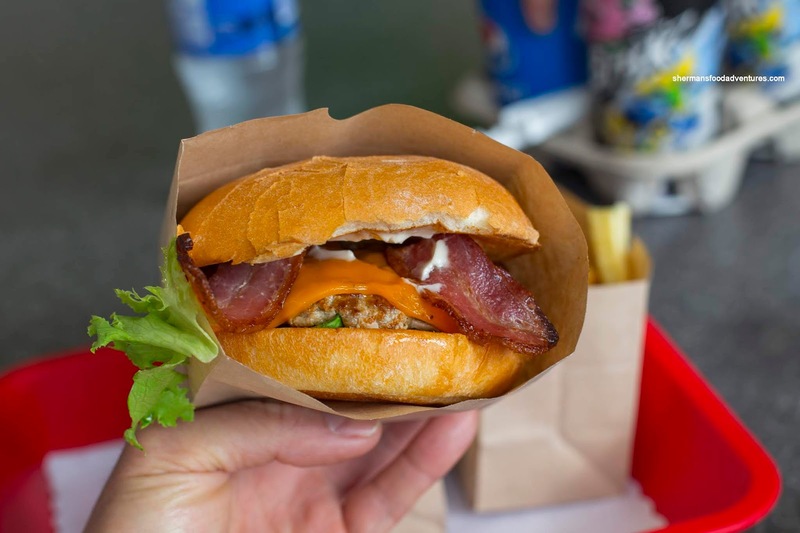 It was flavourful on its own while the bacon really did more for this burger than the steak. I would actually order this for myself (Viv ended up with it this time). 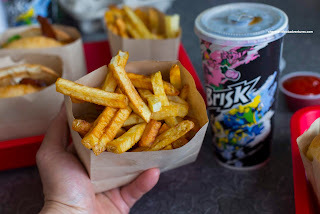 Due to the generous portion of their regular Fresh-Cut Fries, we only ordered 2 of them for 4 people. These were really good being crispy and not overly greasy. Good potato texture left inside. My son had the chocolate shake, but we didn't take a picture of it. Very thick and somewhat sweet, but good nonetheless. The same could be said about everything else as the food was as good as I remembered. So you'd think after 2 burgers, fries and poutine at Hundy, it would be enough to call it a night... Nope, no can do. Eating is a sport and eating more means winning! 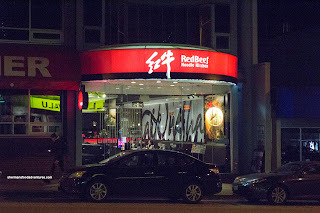 So we made the short walk across the street (probably burned off 10 calories) to RedBeef Noodle Kitchen for 2nd dinner! I've been meaning to try the place out for quite some time and even though we were already stuffed, we couldn't pass up the opportunity. For those who have seen on IG, they are famous for their premium beef noodles, but that wasn't the only thing we ate. Before we got to the noodles, we had the an order of the Salt & Peppery Chicken which was well-portioned. This was very good with large chunks of dark meat that was juicy and tender. On the outside, the batter was thin and crispy. It was also impactful with the right amount of saltiness and spice. Moreover, the dish wasn't overly greasy either. Although it looked more like a garnish, the fried string beans were also texturally on point with a crunch. 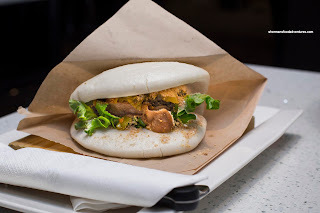 Sporting a large slice of braised pork belly, the Taiwanese Pork Bun was just as good. 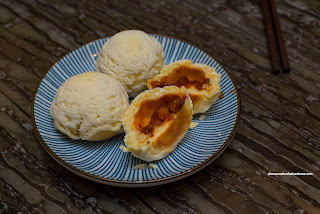 Even though the mantou sat there while we took photos, it remained soft and fluffy. Inside, the pork belly was tender and meaty with only a bit of fat. The classic combination of peanuts and sugar was spot on and provided a nice balance with the spicy pickled mustard greens. Off to the noodles, of course we had their signature Premium Beef Noodles with soup served table-side. The raw slices of beef cooked in the hot broth. They were absolutely heavenly with a buttery texture that only sported a bit of meaty chewiness. Underneath, the noodles were appealingly al dente while soaking up the flavourful broth. Some have remarked that the soup wasn't flavourful enough, but to me, it was meaty and full of depth. The pepperiness was just right where it was noticeable without being too strong. 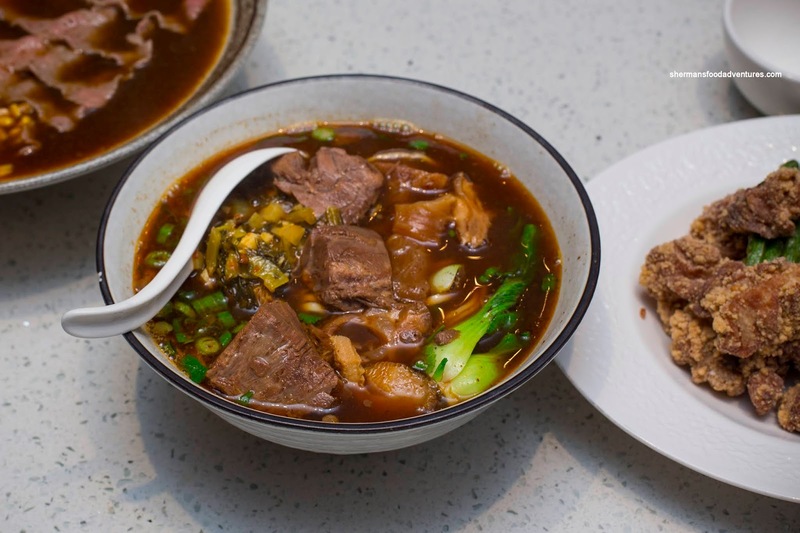 We also got the Beef Noodle Trio with braised beef shank, tripe and tendon. The broth here tasted the same except with the tangy punch of the pickled mustard greens. 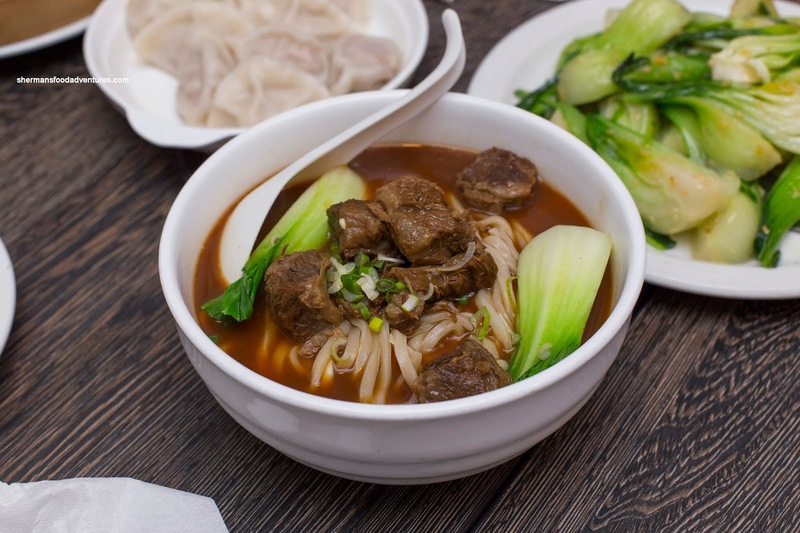 Noodles were just as good while the beef practically melted in our mouths. Tripe had a tender chewiness whereas the tendon was a bit too soft. 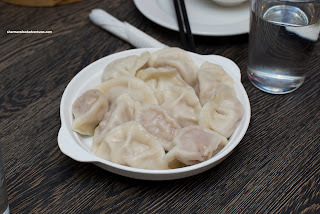 Lastly, we had the Beef Potstickers which didn't resemble the typical shape of the Taiwanese version. One bite and yes, the dumpling wrapper was fairly thin and appealingly chewy, but the beef filling was far too fatty. In fact, there was liquid fat leaking out. Not a great mouth-feel. 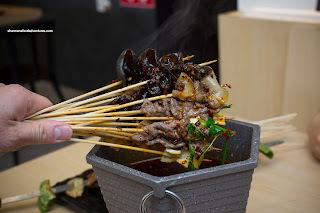 They did taste good (maybe because of the fat) with an aromatic meatiness. Overall, we were quite happy with the food at RedBeef especially the premium beef noodles. Service was actually quite good. We didn't like the beef dumplings, but that was the only negative of the meal. 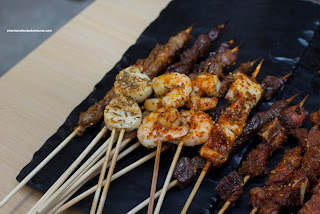 Okay, before you bring out the pitchforks, this is a blog post about food and not about politics. If you want to talk about Trump and the sort, go look elsewhere. To be blunt, I've avoided dining at Mott 32 for this very reason. After awhile, it just didn't make any sense to do so. 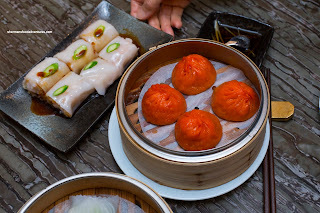 I actually missed dining at Mott 32 in Hong Kong because I knew there was a location right here at home. So I finally made it out to Mott 32 for Dim Sum with my parents and you know what? I'm going to talk about the food for the next few passages. End of story. 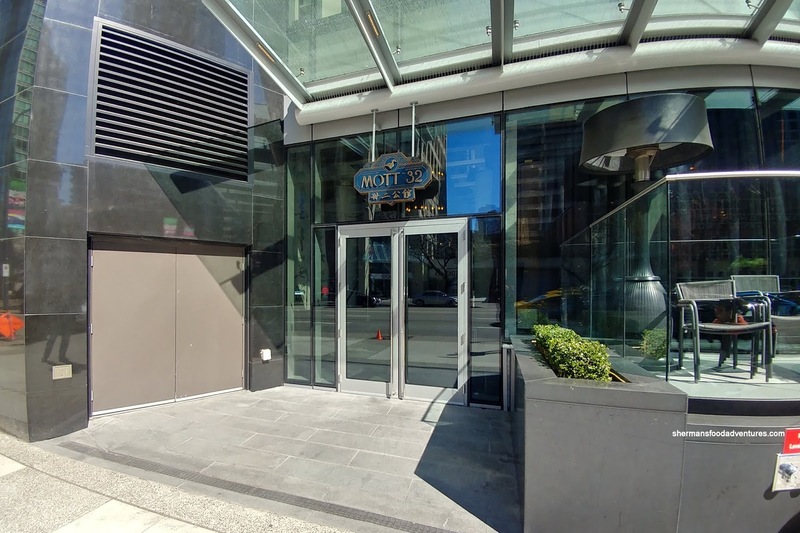 So we all know that Mott 32 has high end pricing due to the food quality, service and decor. 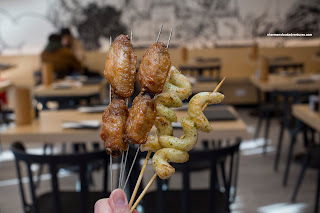 I'm not opposed to spending money for unique experiences, but be aware, Mott 32 is indeed expensive. 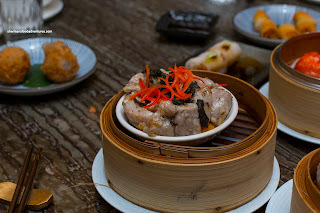 To illustrate this, the Siu Mai consisting of soft quail egg, prawn, Iberico pork and black truffle costs $21.00 for 3 dumplings. Yes, $7.00 per dumpling. Let that sink in for a bit. On that note, these were fantastic with buttery soft pork that had a beautiful rebound. The runny quail egg in the middle was a nice little treat. Combined with the dollop of black truffle on top, there was plenty of umaminess. At $12.00, the Ha Gau with prawn and pea shoots could've been considered a steal relatively speaking. I thought the dumpling skin was prefect with a certain translucency that was chewy while delicate at the same time. Inside, the prawn was top quality being sweet with a buttery snap. I personally would've done without the pea shoots because it made the filling too loose. 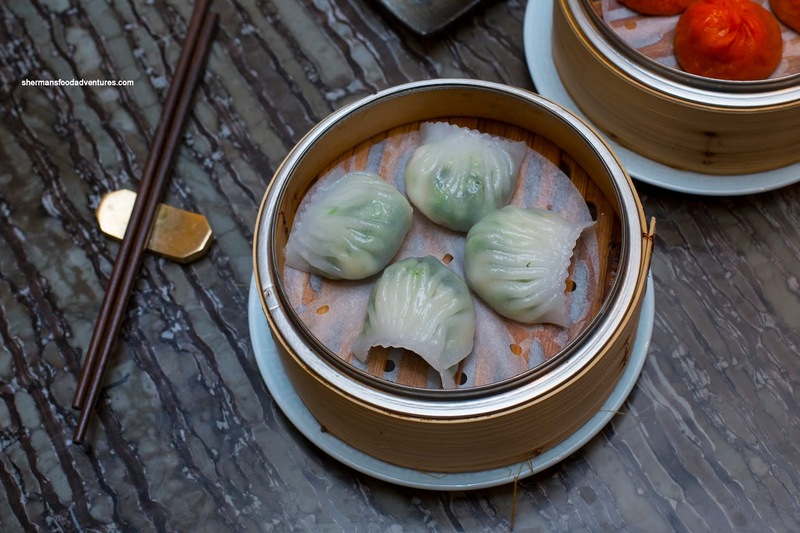 One signature item at Mott 32 is the Hot and Sour Iberico Pork Shanghainese Soup Dumplings. These are always ever-present on IG with their own individual little baskets, but for our serving, they were plated typically on parchment. I would have to confirm the hype on these as the considerable amount of soup inside was a flavour bomb. Measured spiciness combined with an appetizing tang, the soup was encased within a thin chewy wrapper. As for the meat, it was tender with a bit of rebound. Somewhat similar to the ones found at Tim Ho Wan, the Signature Crispy Sugar Coated BBQ Iberico Pork Buns were delicate with a crispy and sweet topping. The bun itself was soft and warm being fluffy with a touch of elasticity. Sweet and aromatic, the BBQ pork filling was fairly lean. 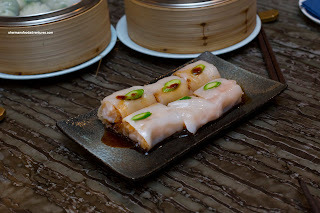 With their Steamed Rice Noodle Roll, it was a bit different as it sported crispy rice paper directly underneath the noodle itself. 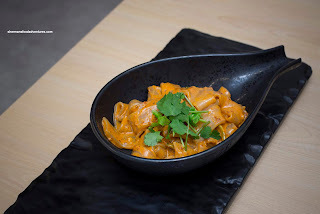 Hence, there was a nice contrast between the thin and soft noodle (with an appealing chewiness) as well as the snap-textured prawn. 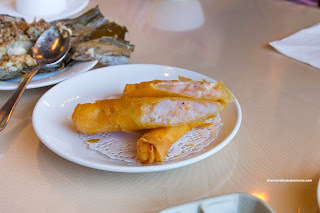 As for the prawn, there was plenty of it where the filling was akin to an overstuffed spring roll. 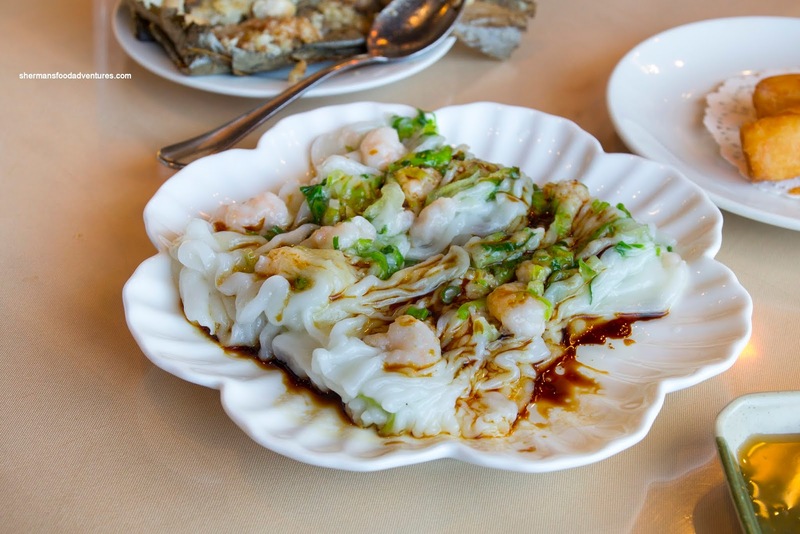 Normally, most rice noodle rolls feature 3 large shrimp per piece. One item that I wasn't that keen with was the Poached Pork Dumplings. Beyond the overly soft wonton-like wrapper, the pork inside was too soft and mushy for my liking. This was further exacerbated by the inclusion of cabbage which made things even more soggy. The one saving grace was the aged vinegar and spicy sauce that featured plenty of chilis. 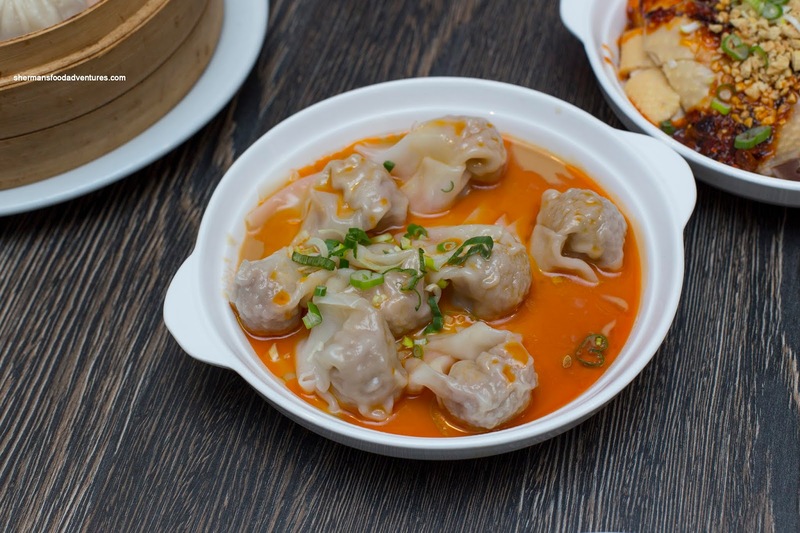 Hence, there was a "spicy wonton" thing going on with the flavour profiles. Two of the more standard-looking and typical-tasting dishes were fried. The Garlic Prawn Spring Roll didn't stray from the ordinary, yet at the same time, was better than most other versions. This started with the high-quality prawn filling where large chunks were present exhibiting the desired buttery snap texture. Lots of natural garlic flavour complimenting the right amount of seasoning. Golden brown, the exterior was crunchy and not greasy at all. 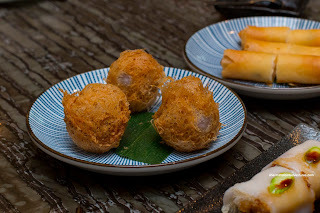 Although smaller than usual, the Taro Croquette stuffed with chicken and prawn was on point. Lightly crispy and not overly oily, the croquettes sported a semi-thin layer of mashed taro. It was flavourful from an adequate amount of salt. Inside, the chicken was tender while the prawn was consistent with the other dishes. The use of chicken helped make this less fatty. 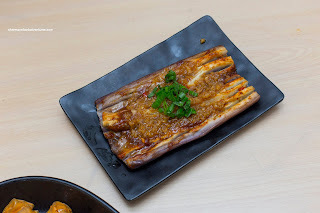 Moving back to pork, we had the Pork Spareribs with pumpkin and spicy black bean sauce. 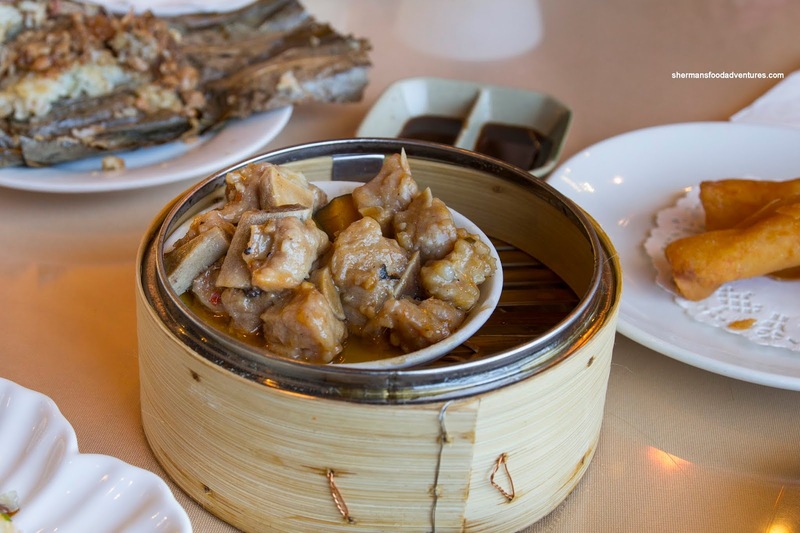 Normally, this would feature little chunks of pork rib and cartilage, but for this version, it was mostly large pieces of meat. 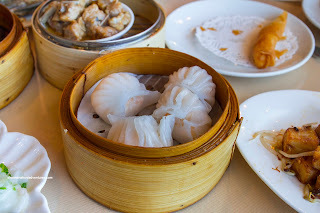 Therefore, the price tag of $12.00 (which is easily double of any other dim sum spot) didn't seem all that outrageous especially with all things considered. Beyond being well-seasoned (albeit not really that spicy), the pork was perfectly bouncy and tender. Okay, for $28.00, the Sweet & Sour Pork at first glance appeared to be overly small in portion size. However, the quality of the pork could not be questioned. With a bit of fat, the pork was tender and bouncy with a thin crispy exterior (even with the sauce). Blessed with aged black vinegar, the barely clinging sauce was sweet and tangy with a high level of depth. 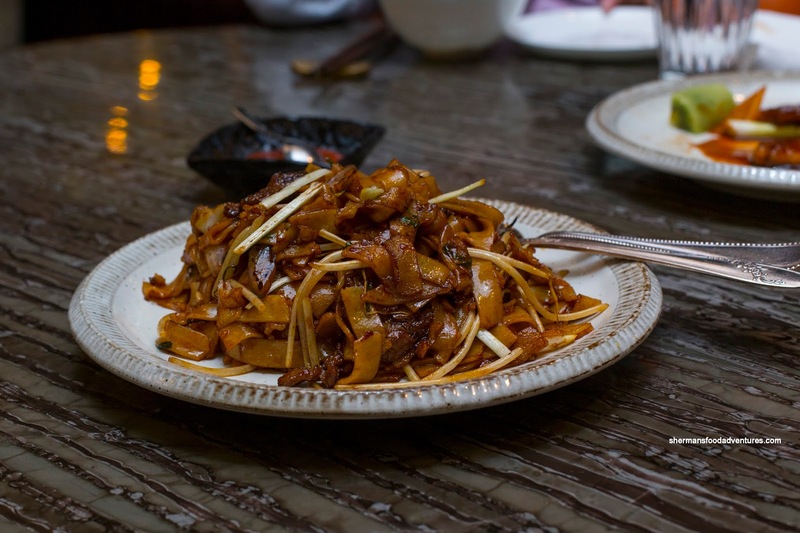 For our noodle dish, we tried the Wok Fried Flat Rice Noodles with AAA Canadian beef and bean sprouts. This was all about execution as the noodles were chewy, fully separated and not grease-soaked. 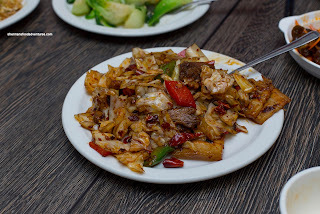 There was plenty of caramelization and smokiness from the proper wok heat (wok hei). Beyond the attractive colour from the dark soy as well as the wok fry, there was enough seasoning for impact without being salty. The AAA beef held up its side of the bargain being tender and buttery. 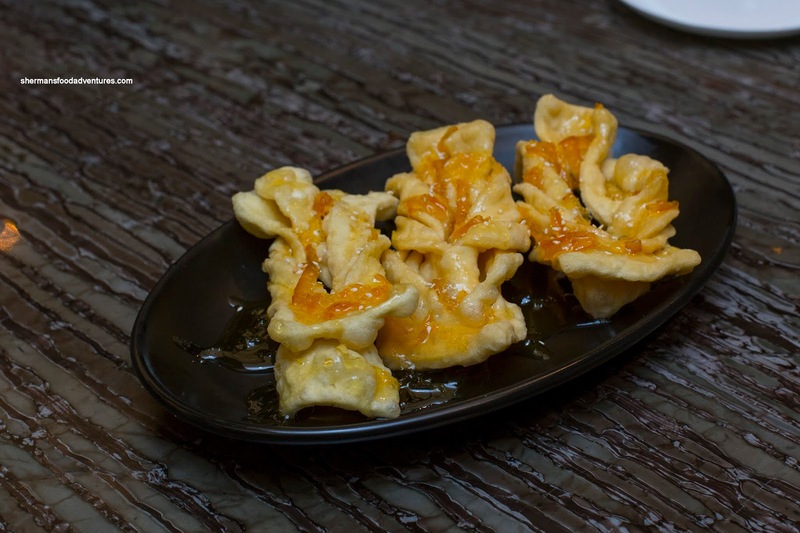 For dessert, we shared the Crispy Egg Flour Pastry drizzled with honey, citron and sesame. These were light and airy featuring a soft crispiness. Although sweet, it wasn't overwhelmingly so. The addition of the orange rind created a marmalade-type effect where it was bitter, tangy and bright. Overall, we enjoyed the Dim Sum at Mott 32 and for some dishes, we can see understand the pricing given the level of service, quality of ingredients and level of execution. However, this is literally not everyone's cup of tea, so it really depends on your budget. This visit to Mama's Dumplings was supposed to happen like half-a-year ago. You see, I was scheduled to meet up with Nora, Lesley and Joyce for our monthly eat-up there. However, due to accidents on both the Knight Street Bridge and Oak Street Bridge, traffic was at a standstill. So after waiting for an hour and barely moving a few blocks, I gave up and turned around. 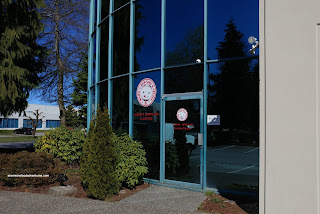 Since then, I've tried to make it out there, but really, it is located just South of Ironwood Plaza on Steveston... Yep, not the closest spot to where I live. But I made it a point to get out there at last with Uncle Willy for lunch. 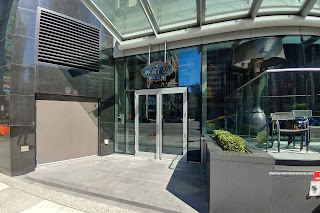 As mentioned, this place resides amongst warehouses and other businesses offering a unique lunch option. They also serve coffee and other beverages where we tried the Americano, Matcha Latte and London Fog. I'm not coffee expert, but Uncle Willy remarked that it was decent where he could drink it without the aid of sugar nor cream as it was smooth enough. 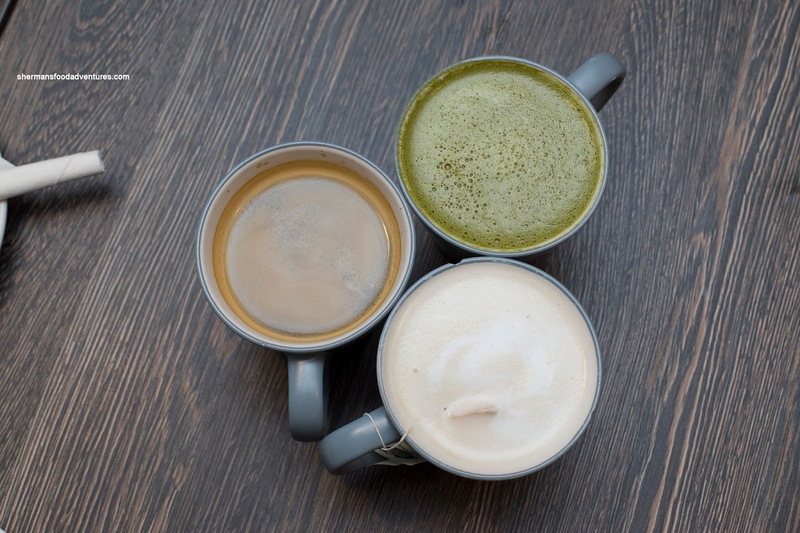 The matcha and London fog were flavourful, but overly sweet. Okay, let's cut to the chase by talking about the Xiao Long Bao. These little suckers were pretty legit. 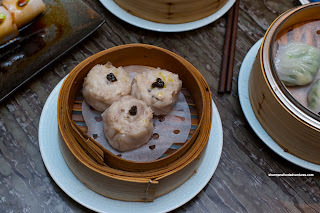 Being Nanxiang-style, these featured a thin dumpling skin that was tender with a touch of chew. Inside, there was a considerable amount of sweet soup. I found the meat to be moist but a bit overly loose. In the end, these were very good. 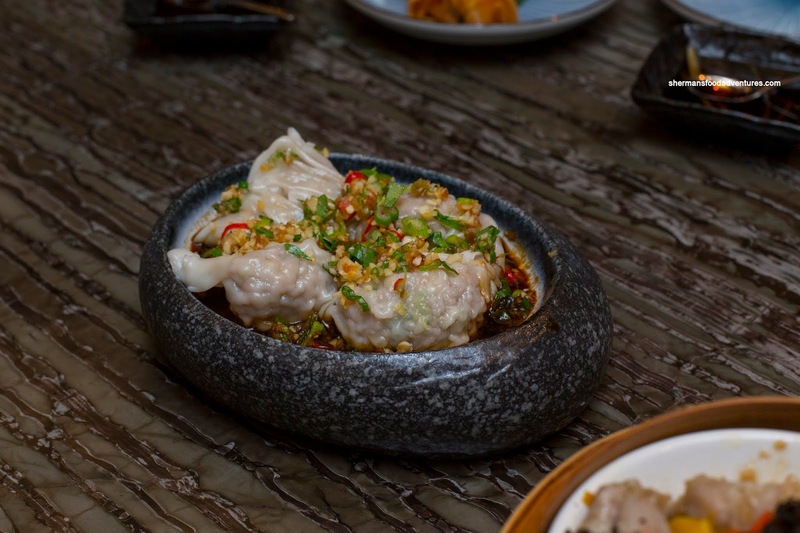 We found the Boiled Pork and Cabbage Dumplings to be excellent as well. These featured a medium-thick dumpling skin that had a good elasticity while being soft and delicate at the same time. Now that was find and dandy, but the best part was the filling as it had more meat than cabbage. It was juicy and moist with plenty of seasoning that was a good balance between salty and sweet. Although the Mouth-Watering Chicken wasn't exactly an authentic version, it was still pretty tasty in its own right. It was a fairly large portion of tender and moist chicken with gelatinzed skin. More akin to hot bean paste, the sauce didn't have the classic Szechuan numbing spice, but it was flavourful. The flavour profile was more salty chili pepper than anything else. 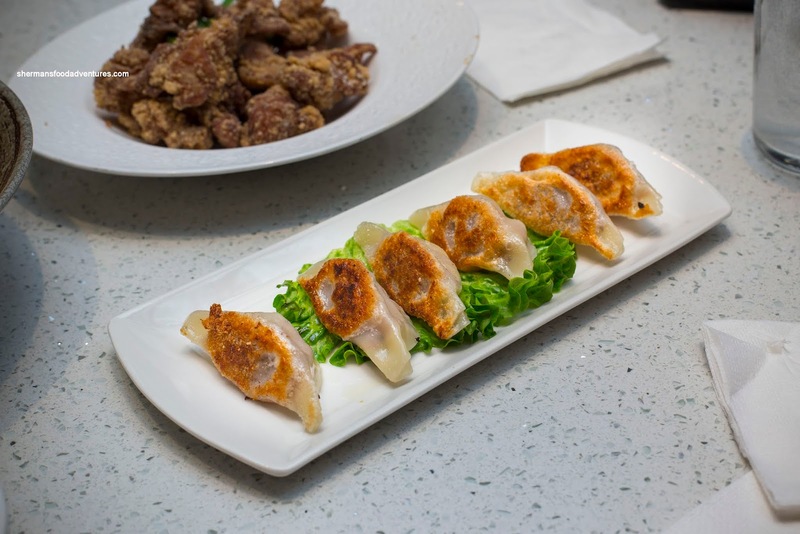 The next 2 dishes were complete duds in our opinion. Looking like it was more like a soup noodle than Dan Dan Mein was not very good. The peanutty "broth" was practically devoid of impact as it was only aromatic without spice nor salt. I actually felt like grabbing the soy sauce and pouring it in (the horror!). Furthermore, the noodles were overly soft and mushy. This has to be one of the worst I've had in the GVRD. So let's take this and put essentially the same flavours into the Wontons in Spicy Chili Oil shall we? Well, you can guess how bland the dish was right? I have to say they need to take spicy out of the menu description because this was essentially peanut sauce. With this being said, the wontons themselves weren't bad. 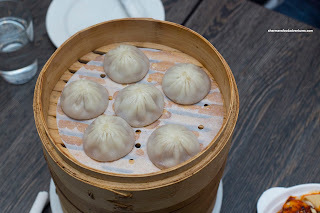 They were packed with a semi-dense pork filling which was bouncy and flavourful. 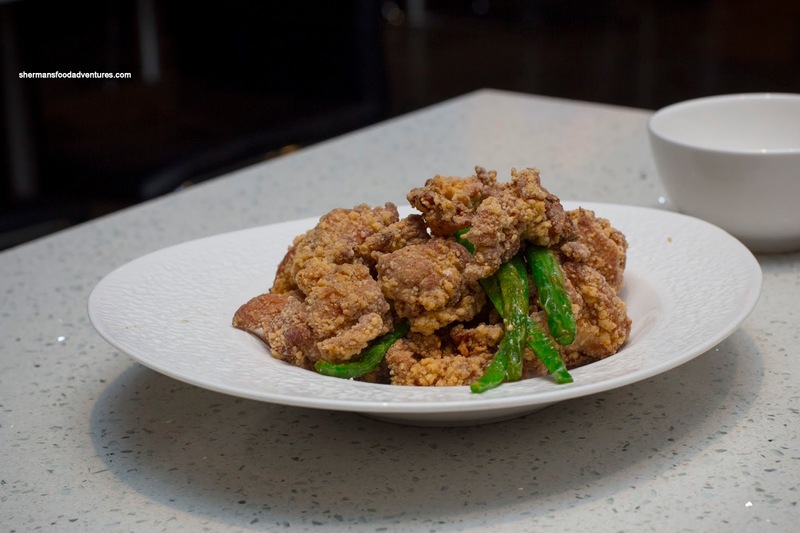 We got back on track with the Fried Pork Belly that really should've been called Double-Cooked Pork Belly. Whatever the name, it was executed properly with big slices of pork belly that was tender with an exterior sear. It was stir-fried with crunchy cabbage and peppers. The dish was on the saltier side, but best eaten with rice anyways. I found the spice level to be medium where it was apparent without being too excessive. Personally, I could take it spicier. To provide some balance, we got the Seasonal Vegetable with Garlic. 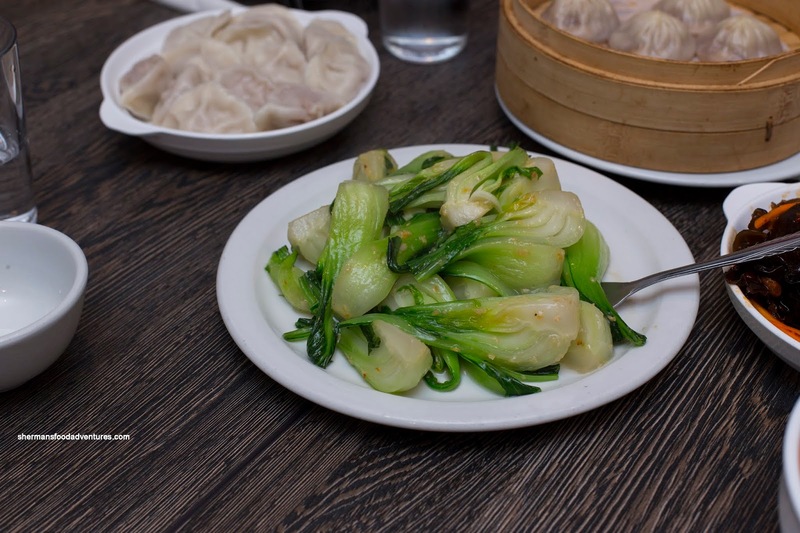 It turned out to be Shanghai bak choy and honestly if I had known, I would've stuck with the broccoli or green beans instead for the same price. If we focus on the execution, it was done right with very little moisture at the bottom of the plate. Lots of wok heat where the bak choy was cooked through while still being crunchy. Unlike the dan dan mein, the Stewed Beef Noodles were appreciably better. 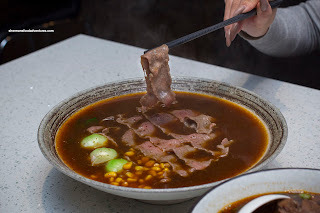 The broth itself was fairly meaty with a good cloudiness that provided depth. It was sweet and mild. On top the stewed beef appeared to be the beef finger meat (or the meat in between beef ribs) which was tender and buttery. They were well-seasoned by the braising liquid. 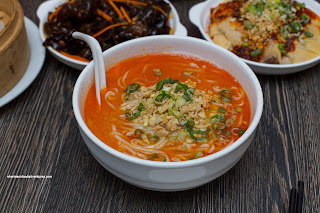 Nestled within the soup, the white noodles were not al dente, but not as soggy as the one in the dan dan mein. 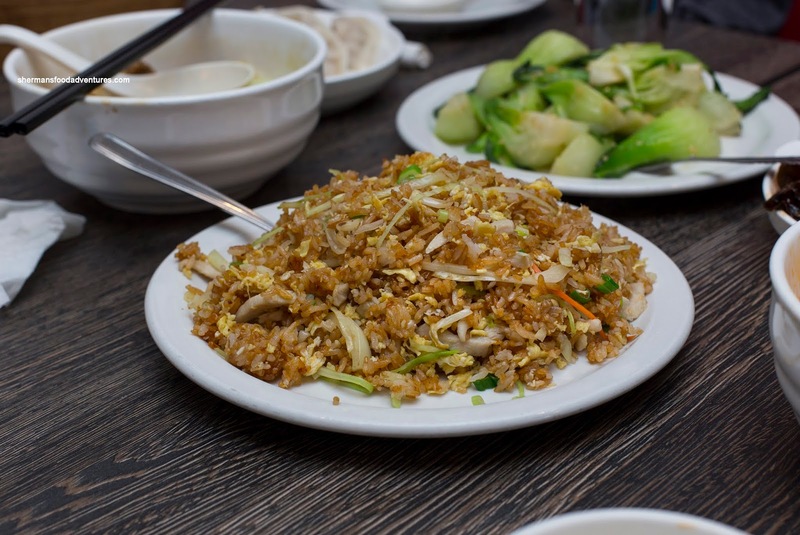 To get something from each section, we got the Fried Rice with chicken and egg. I asked if there was green onion and they said no, but yah the rice had green onions... Other than that, the dish was done right with chewy discernible grains of rice that was fully caramelized and nutty. There was enough seasoning while the veggies were not overdone. I wish there was more chicken though. We ended up getting a few cold appies in the Cucumber Salad and the Black Fungus (Wood Ear Mushroom) Salad. We liked how they were large in portion size and that they were noticeably spicy. In terms of texture, both were crunchy with enough moisture without making it wet. We did think that the cucumber was lacking inherent impact as beyond the sauce on the outside, it was pretty bland. 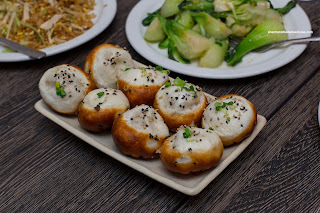 One of the other more popular dishes at Mama's is the Shanghai-Style Fried Pork Bun. By appearances alone, this was a winner with a significantly crisped up and brown bottom. We did enjoy the moist juicy filling, but the bun itself was rather chewy and somewhat dense. Not a bad version by any means, but not as good as the XLBs. So this brings up my main point about Mama's Dumplings - that the XLBs are probably the best thing going for them. Otherwise, I wasn't exactly wowed by anything else. I would return for the XLBs, but that's about it. 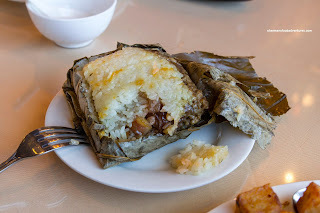 Not too long ago, we visited the newly opened Mei Le Bakery & Restaurant for dinner. 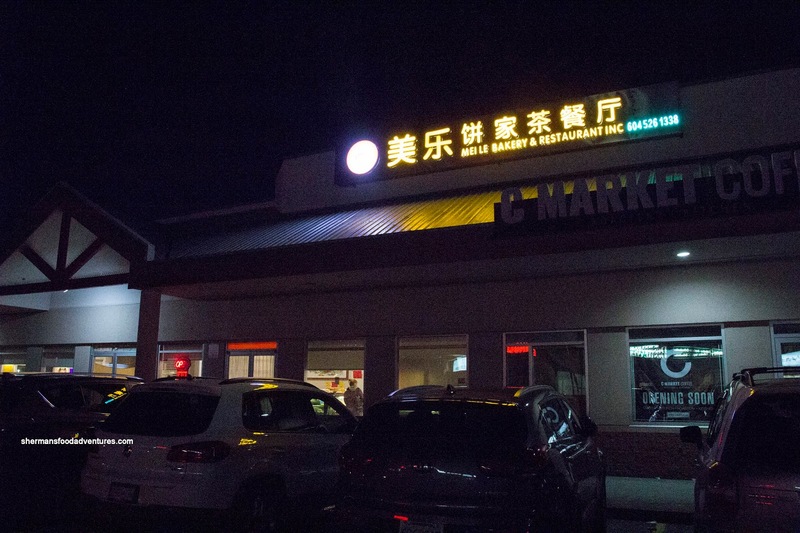 In actuality, it didn't change too much from the previous occupant - Grand River Chinese. The major addition was the Chinese bakery and BBQ that now occupies the right side of the restaurant. They took away some seats to accomplish this, yet funnily enough, this is where they added some seats back right in front of the BBQ display and within a few feet from the bakery display cases. This is where we were seated for our revisit for their Dim Sum service. Suffice to say, the foot traffic around us was pretty brisk and staring at BBQ ducks throughout our meal was interesting. 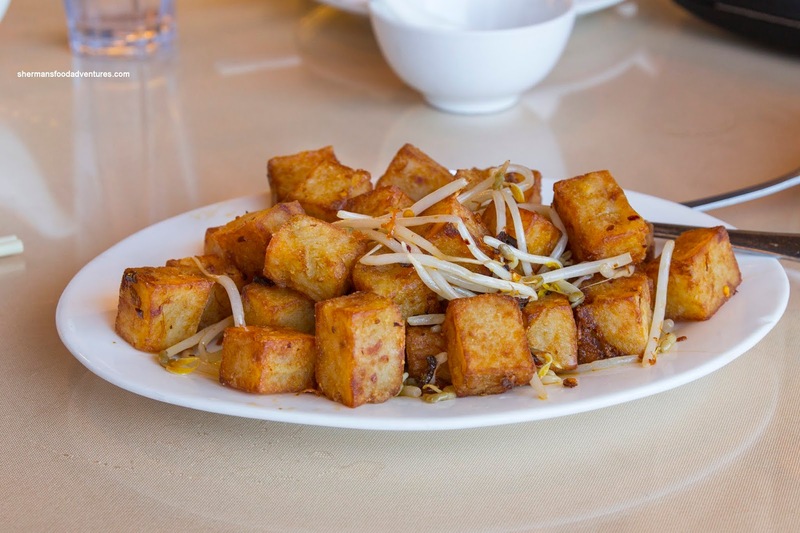 The first 2 items to arrive were larger in size including the XO Fried Daikon Cake. This was decent with soft cubes of daikon cake that held together. They were crispy on the outside and not overly greasy. There was some spice, but I would've liked to see more XO tossed in. 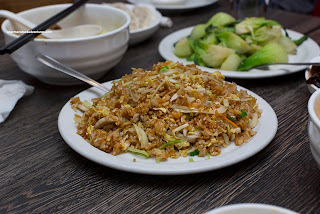 Sometimes a minor detail, but the bean sprouts were still crunchy and also not too greasy. 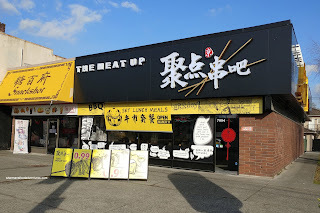 I'm not sure if it was because the Lo Mei Gai was sitting in a steam warmer at the bakery, but it wasn't hot. It was actually lukewarm and the middle wasn't even moist. In fact, it was hard and dry. Did it need more time in the steamer before they put it in the display? Was the warmer not hot enough? 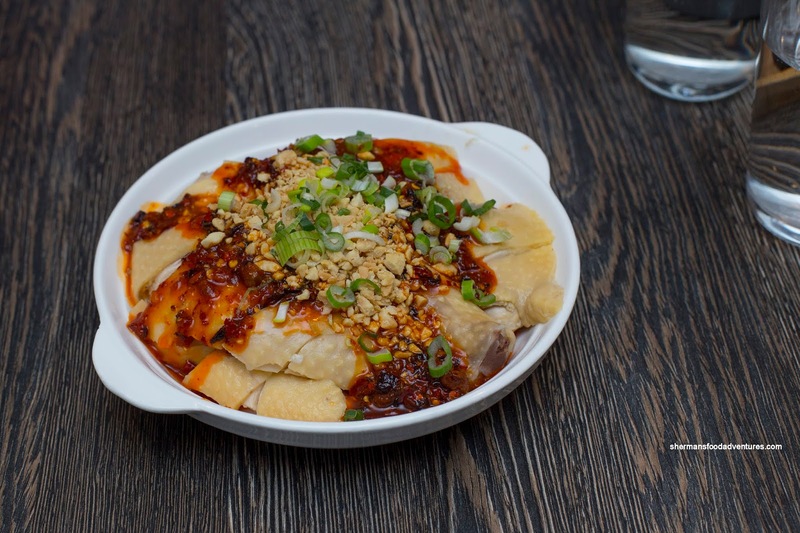 Not sure, but greatly impacted this dish and due to the texture, it wasn't very good despite the ample ingredients. Next, the Shrimp Rice Noodle Roll looked absolutely bizarre where it was one continuous ribbon/sheet of noodle with lots of green onion throughout. As you can see in the picture, the shrimp was strewn everywhere like some open face version of this dish. The noodle quality was actually quite good being buttery soft with some elasticity. However, they completely overdid it with the green onion and should've called it a green onion rice noodle roll instead. At least the Shrimp Spring Roll was more typical. It featured plenty of shrimp and shrimp mousse packed into the middle. So much so, it was a touch dense. Whatever the case, it was still juicy with a buttery snap. It was well-seasoned and the wrapping itself was crunchy. 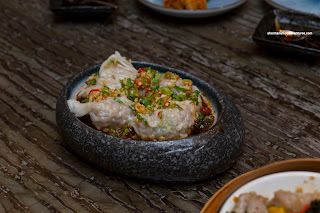 Onto the Ha Gau (Shrimp Dumplings), it was a bit hit and miss. 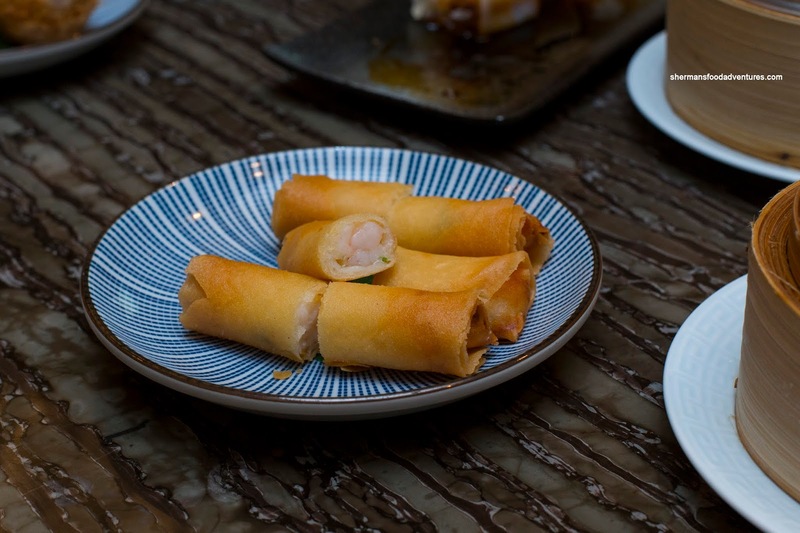 Nothing wrong with the filling as it mimicked the spring roll with a moist buttery snap as well as being properly seasoned (but not too much, as we could taste the natural shrimp sweetness). The real problem (and you can see in the picture) was the thick and gummy dumpling skin. This made for a unpleasant mouth feel and also lead to the shrimp filling falling out. 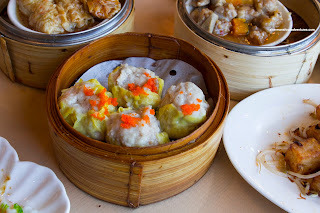 On the other hand, the Siu Mai (Pork & Shrimp Dumpling) was remarkably better. These featured a buttery and juicy bounce where the pork and shrimp were nearly the same texture. Seasoning was on the milder side, but that wasn't a bad thing as the dumpling ate mostly sweet. I dunked it in hot sauce anyways. 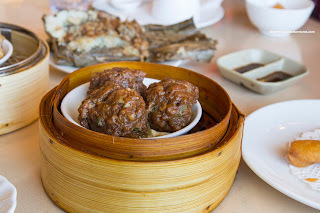 In a very deep shade of brown, the Beef Meatballs were probably the victim of too much dark soy. Visuals aside, the meatballs ate a whole lot better than they looked. They were airy and bouncy with quite a bit of beef flavour (which is usually not the case). I guess other than the dark soy, there wasn't a whole lot of seasoning. There was bits of water chestnut to add some crunch and the amount of green onion was surprisingly low. On the flip side, the Steamed Pork Spareribs were a bit pale in colour. Once again, appearances didn't mean much as these also ate well. Loved how most of the pieces were meaty rib portions where the fat and cartilage was kept to a minimum. 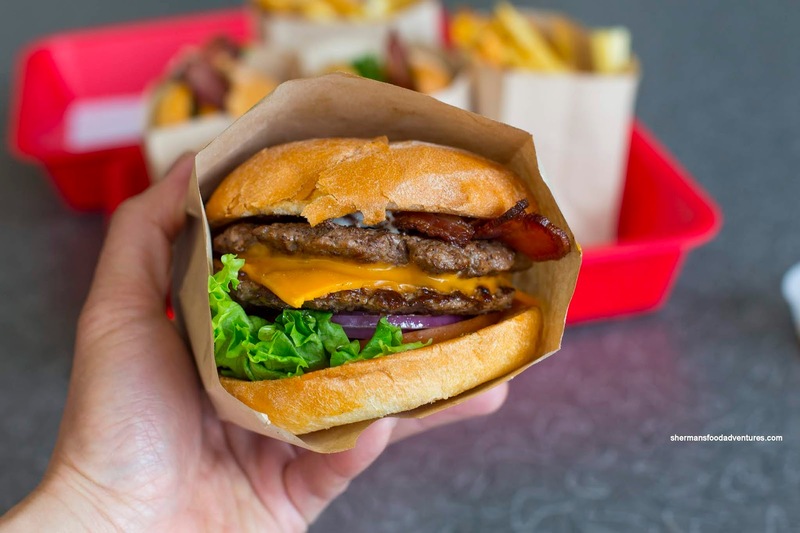 Beyond the natural meatiness, there was a firm rebound. There was plenty of garlickiness to go around, yet there was lots of pork flavour left. 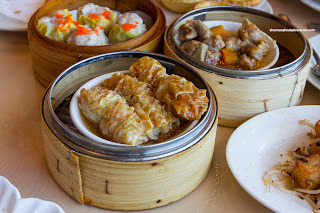 With our last 2 dishes, we went for the Bean Curd Skin Roll and the proverbial Egg Tarts. Featuring tender, yet chewy fried sheets, the bean curd skin roll was texturally on point. Inside, the bouncy pork filling was well-seasoned and moist. 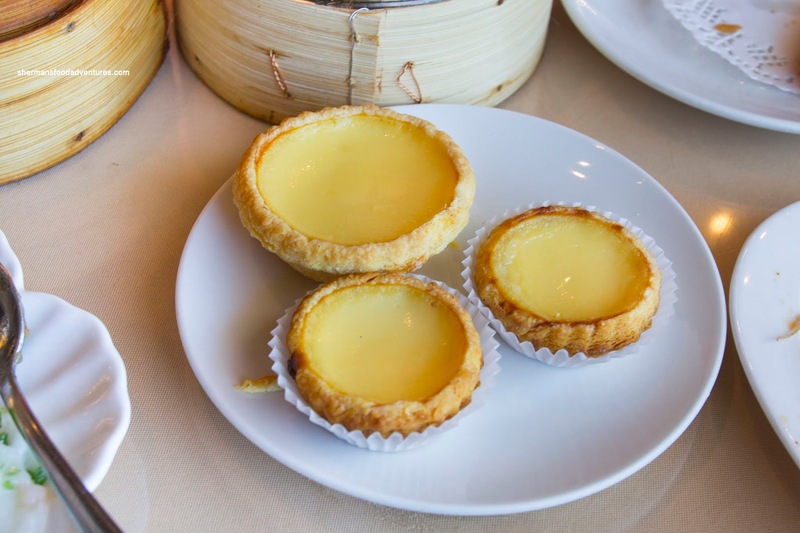 Now if you were wondering why the egg tarts consisted of 2 small and 1 large, it was because they ran out of the smaller ones. By virtue of being plucked from the bakery display case without reheating, these were not a their optimal state. Even with that being said, they were average with a dense pastry that was still buttery. The egg custard was stiff due to the temperature where it was semi-sweet. This was not really the ending we were hoping for here. 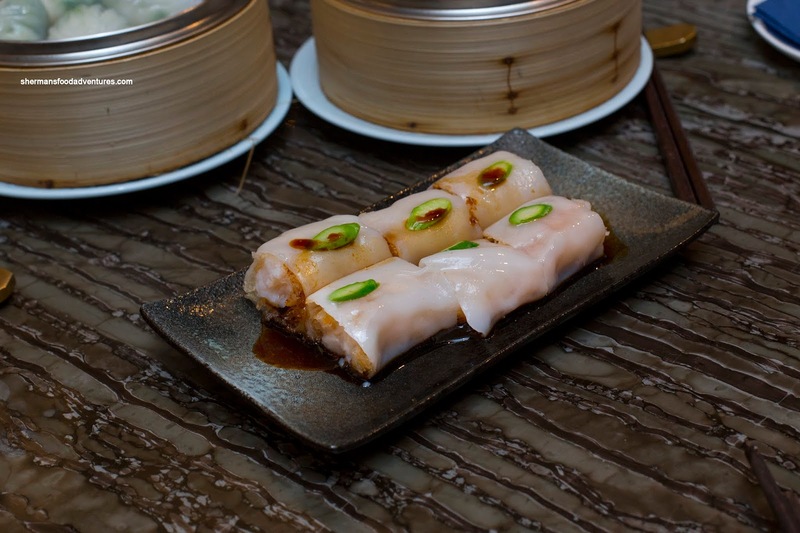 But it really did reinforce the feeling that the Dim Sum service is merely average at best. It also didn't help that some items were not freshly made which didn't help in terms of eating enjoyment. 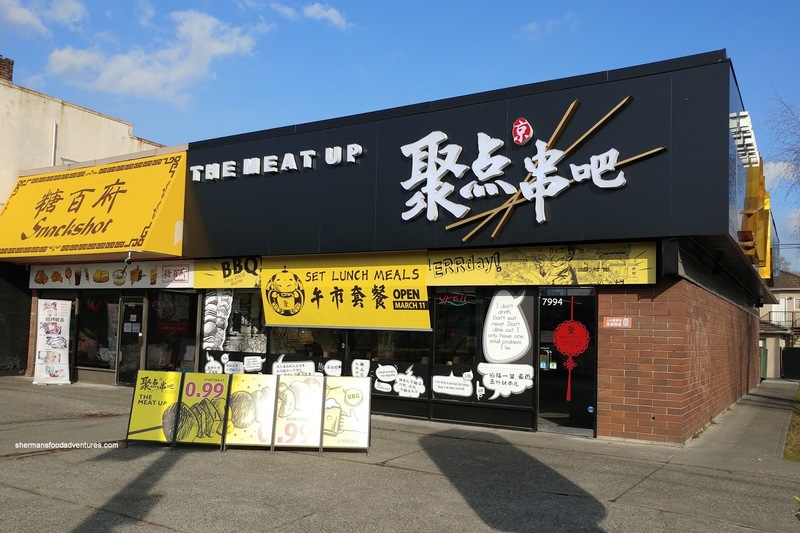 After my initial visit to Happy Tree on Kingsway, I've been in search of another Chinese skewer spot that didn't blow my eardrums out with loud K-pop. Furthermore, the thought of ordering minimum 10 skewers of each meat didn't impress either especially with only 2 people. Let's just say that my recent visit to Chi House BBQ didn't challenge Happy Tree. 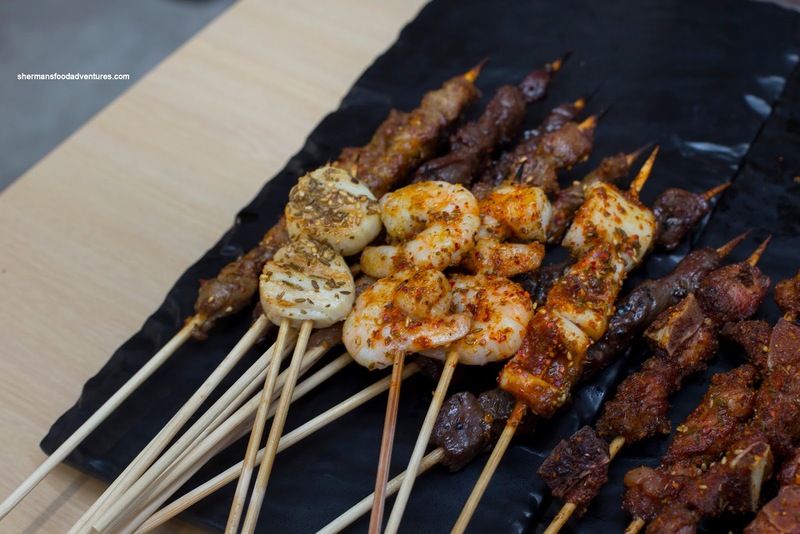 In fact, it merely reinforced the fact I would have to endure loud music while eating an over-ordered amount of skewers. However, The Meat Up on Granville caught my eye after taking in dessert at the Snackshot right next door. I returned to see if they could satisfy my urge for meat on a stick. 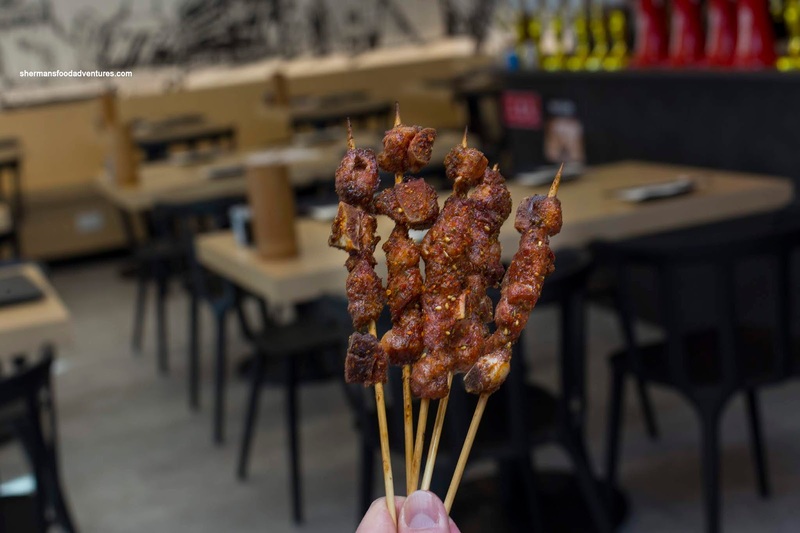 As with any of these skewer places we got the basics in the Traditional Lamb and Black Pepper Beef. Not that there wasn't any meat on the sticks, but as evidenced in the picture, there could be a touch more in my opinion. In terms of texture, I thought the lamb was pretty moist with a good amount of cumin and spice. The beef wasn't as flavourful since the black pepper was a bit weak. The meat was definitely more firm, but yet again, it was tender. 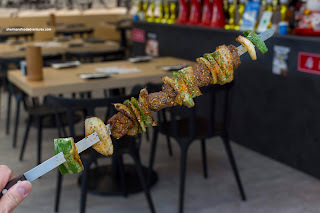 Something that was different and interesting was the Signature XL Lamb Skewer for $9.95. Yes, it was long, but in between the chunks of lamb, there was plenty of green pepper and onion. Value is debatable, but in terms of eating enjoyment, this was excellent. The meat was appealingly gamy and well-spiced while being super tender. One of my favs of the meal for sure. Just to get some variety, I decided to try the Spicy Pork Spareribs. Since they were ribs, I already knew that half of it couldn't be eaten, so I'm not going to comment on the value. In terms of texture, they were pretty good exhibiting the classic chewy bounciness. It wasn't as spicy as I would've liked, but then again, I like things spicy. At the very least, I wasn't forced to order 10 of these. For some seafood, we had the Scallop, Spicy Shrimp and Squid. The scallop was pretty mild-tasting which was fine as I prefer to taste the subtle sweetness rather than being overwhelmed with seasoning. Texturally, it was a touch overdone. Again, the spicy shrimp wasn't really that spicy, but there was a kick. They had a nice snap texture. The squid was good being just cooked being an appealing chewy. Some items that didn't include skewers was the Cold Liang Pi Noodles. As much as the colour was pretty monochromatic, the flavours were pretty good. There was mild spice to go with some sweetness and plenty of peanut. Personally, I would've liked more chili oil and vinegar though. Yet at the same time, it wasn't as if this wasn't good either. Texturally, the noodles were chewy, but could've been less soft. 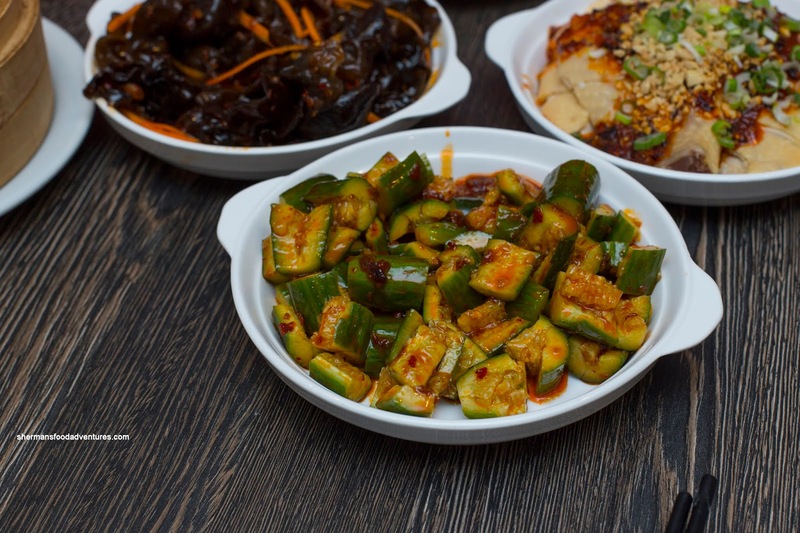 For our one vegetable, we had the grilled Eggplant with plenty of minced garlic on top. I enjoyed how the eggplant was tender and delicate without becoming mushy. Due to the copious amount of garlic on top, there was no absence of aroma and flavour. The only thing that I didn't like was the greasiness of the eggplant itself. Back to the skewers, we got the Honey Chicken Wings and the Grilled Rice Cake. 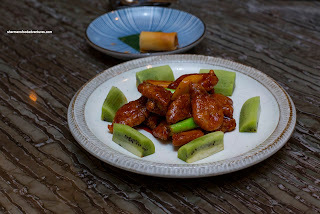 Surprisingly to me, the wings were my second favourite items as the skin was well-rendered and crispy. As advertised, they were indeed sweet and sticky with honey. Also crispy on the outside, the rice cakes were chewy on the inside. Our last item was the Special Spicy Tripe Pot featuring tripe, beef, beef throat, beef tendon, black fungus and seaweed. One thing that struck me about these skewers was the meager amount of meat. Aside from that, the spicy broth was delicious achieving the balance between heat and flavour without one dominating another. 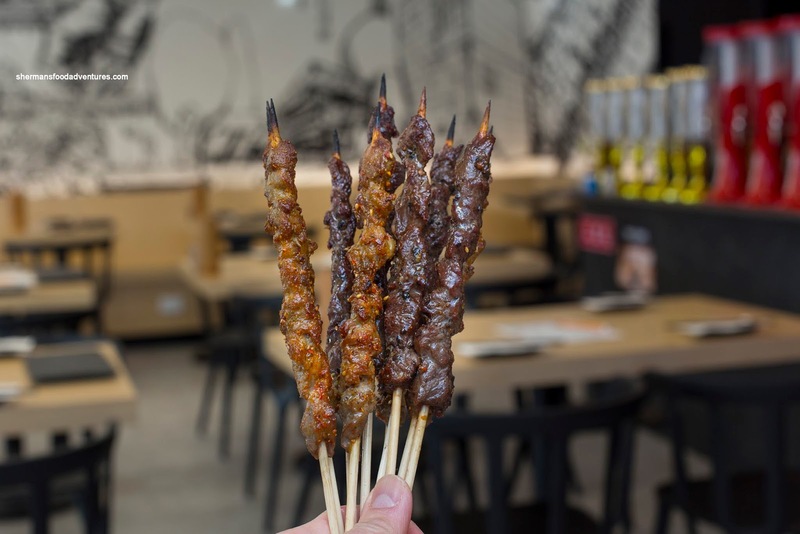 Overall, the skewers at The Meat Up were good and the service was fairly decent. I thought the prices were consistent with other restaurants of this ilk. A good option for those wanting this type of cuisine.